Telescopic Pole and Camera systems for Elevated Real Estate photography. 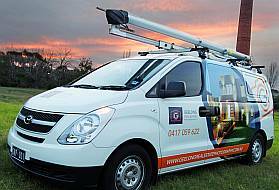 We supply complete equipment packages for any Property Photography business covering whole fleets to sole operators. 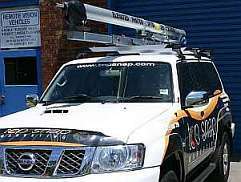 Since 2005 we have supplied over 100 complete systems to the 2 largest real estate photography franchise chains in Australia, Open2view and Topsnap, that are both located in all states nationwide. Although both the franchise chains are competing companies they agree that our elevated photography systems are the prefered equipment for domestic and industrial real estate businesses. In addition to franchise chain owners we have also supplied a number of independent professional photographers in Australia, USA, The Netherlands, Switzerland and New Zealand. Our equipment was designed from the ground up for the express purpose of commercial elevated photography, our system unlike others is not an adaption of existing communication mast systems or camera mount system. Equipment is serviced by us and all assembled at our factory in Victoria, Australia. The systems are turnkey and so can be purchased and after fitting used to work with no additional equipment needed. 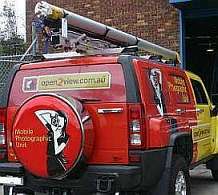 For an example of landscape images you can capture with telescopic pole camera system see the elevated images gallery at the link of images taken all around our city in Melbourne Australia in early 2003 using the first 15 metre trailer mounted mast system for doing photography. That evolved into the Remote Vision Vehicles business in 2005 making complete pole systems for others. Please contact RVV if you would like more information about vehicle mounted or portable mast system packages we have to suit professional photography.